It’s not everyday I get the chance to review a death metal band from the <?xml:namespace prefix = st1 ns = "urn:schemas-microsoft-com:office:smarttags" />Middle East... but...<?xml:namespace prefix = o ns = "urn:schemas-microsoft-com:office:office" /> ladies and gentlemen... let me introduce you to NERVECELL. Formed in 2000 in Dubai in the United Arab Emirates and this album called ‘Preaching Venom’ is their debut full-length album if I’m correct? We get 10 quite strong, fast paced tracks peppered with a lot of groove, guitar squeals and melody. We get crunchy yet fast riffs that will crush your skull in... even though ‘Preaching Venom’ do need a few spins to really sink in. Well... the CD opens with a short intro but suddenly the burst into the very strong “Vicious Circle of Bloodshed” that contains guitar runs that reminds me of the mighty VADER. 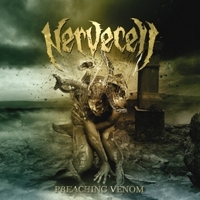 NERVECELL continues to surprise me with “Flesh & Memories”... a track that really shows their potential. They mix death metal with thrash metal to perfection on this track... believe me. The quite brutal “For Every Victim Fallen”... the crunchy and very thrashy “Haute Monde Façade”... the very catchy (if you can use the word “catchy” in this genre) “Demean” are also tracks that are worth mentioning on a quite strong release. The production is crunchy yet crystal clear and suits the songs great... so there are no excuses not to check this album and band out now.